M.A.P. 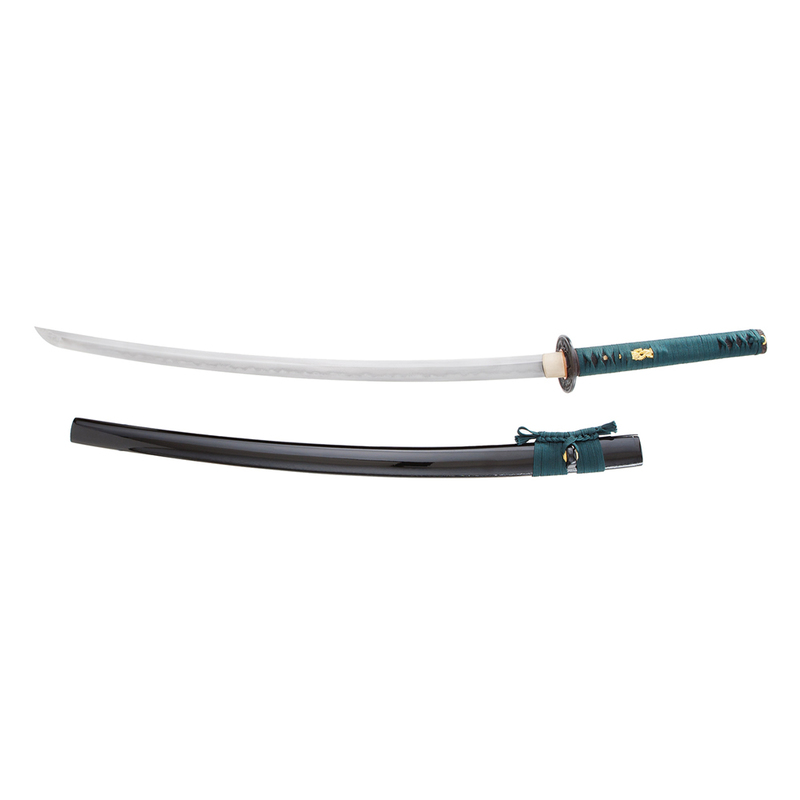 $ 699.00 Our Competition 14 Fold, 1060 High Carbon Folded Steel Competition Cutting Katana is designed for cutting goza, green bamboo, tatami omote and tameshigiri. The blade is completely forged, folded, polished, crafted and assembled by hand from the most experienced craftsmen and smiths at the Imperial Forge. The Competition blade boasts a 10″ long, 8mm thick, 25mm wide tang with no taper. Mid blade is 6mm thick & 29mm wide, tapering to 5mm thick & 25mm at the kissaki. This brings the balance point forward to 5 1/2″ for an easy cut. 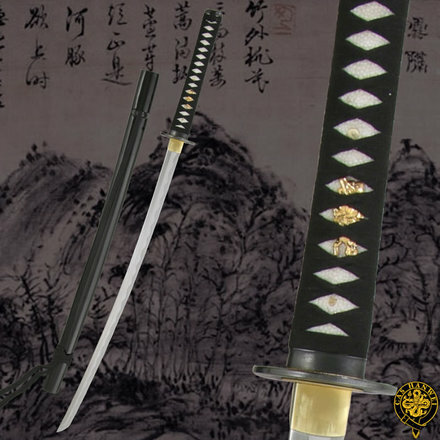 Using 1060 high carbon steel, folded 14 times creating 16,384 layers combined with the thickness of the blade, the Imperial Forge as created one of the most durable competition cuttings swords available on the market today. The full black same’ wrap and dark green cotton, double wrapped ito helps protect tsuka from the oils and sweat from your hands during training; as well as making a very comfortable, non-slip grip. We’ve also added a same’ wrap to the saya to protect the finish of the saya from scratches and to add a comfortable, non-slip grip. The Imperial Forge Competition Katana also comes with a silk bag . 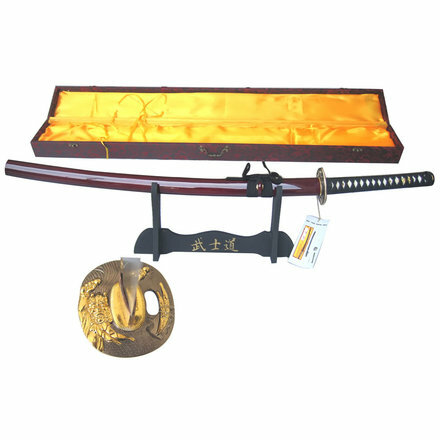 The katana features a black dragon tsuba and gold dragon menuki. 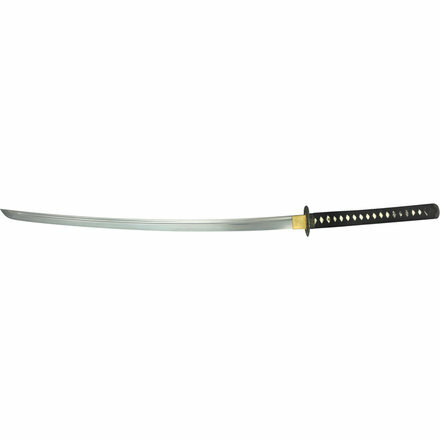 Steel Type:1060 High Carbon Fold / Layers:14 / 16,384 Ha:Convex/Moran Mune:Ihori Hada:Masame Makago:Futsu Weight:2 lbs 13.5 ounces / 250 Grams Blade Length:28″ Tang Length:10″ (no taper) HRC:62 / 44 Nihonto Suguta:Hira-Zukuri Kissaki:Chü Jihada:Medium Hamon:Sugu Mekugi-ana:Double Pegged Mei:Yes Blance Point:5 1/2″ Tsuka Length:11″ Overall Length:39 1/4″ Cut Ability:Medium / Heavy Keeping with Japanese traditions our Imperial Sword Collection is crafted using only traditional materials and fittings. The Tsuba (guard), Fuchi (collar), and Kashira (pommel) are expertly made and finely crafted from black iron. The Habaki (blade collar) is hand made out of polished brass and each tsuka (handle) is covered in ray skin and tightly wrapped in the traditional cross over style ito (braid). It takes time to produce folded blades of this quality and this is why our Imperial Sword Collection is more difficult to acquire. We take great pride in the quality and performance of or swords, we will not compromise this quality and/or performance.